Marti Gras party prom favors are the way to go, take it from me. How about a big colorful party theme for your big colorful prom party? Here you have it! You can decide how you want the logo, and decide between lots of colors. 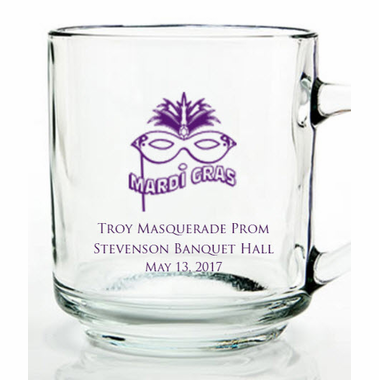 Having these mementoes will help your guests remember what fun it was to masquerade around at the Marti Gras prom. Practical, personal, and a prize. 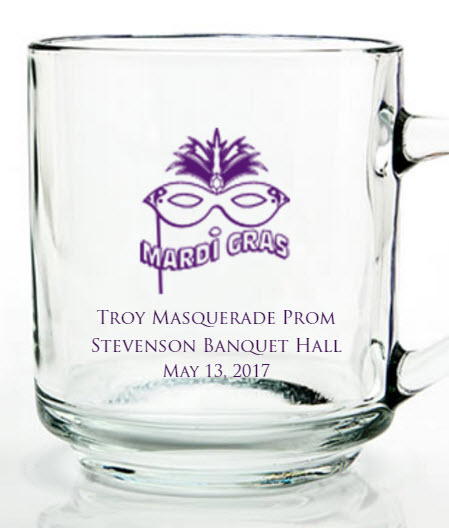 Clear classically shaped mugs measure 3 1/2" tall x 4" in diameter and have a 10 ounce capacity. They come bulk packed with an option to buy a box for .70 each.